Are you looking for a small kitchen change that can make a big statement? Consider the powerful punch that a colorful, eye-catching or elegant backsplash can make. Positioned behind the sink, the stove or both, a backsplash plays dual roles. When made of an easy-to-clean material, it can function as a protective feature that guards against wall damage from splashing water or grease. 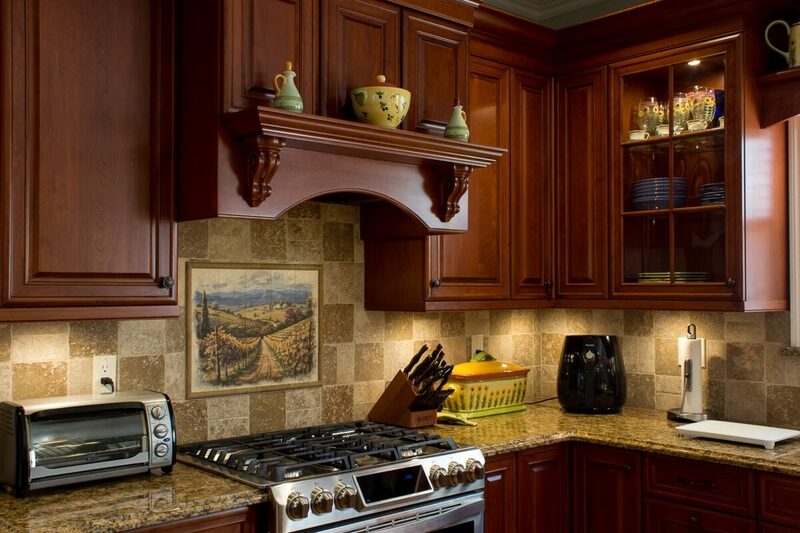 A backsplash can also serve as a key design element for your room. For decorating inspiration, check out this list of kitchen backsplash ideas. You're sure to find at least one idea that suits your style. If you cook frequently, there's no denying the convenience of a pot filler faucet. This folding apparatus allows you to fill a pot of water right on the stove. You just have to position your pot on the burner, extend the faucet arm so the spigot is right above the pot, and turn on the water. You'll find yourself using this faucet a lot if you often cook pasta or other foods that require that you boil a large batch of water. It's especially handy if you own large stockpots that are too tall to conveniently sit under your standard sink faucet. 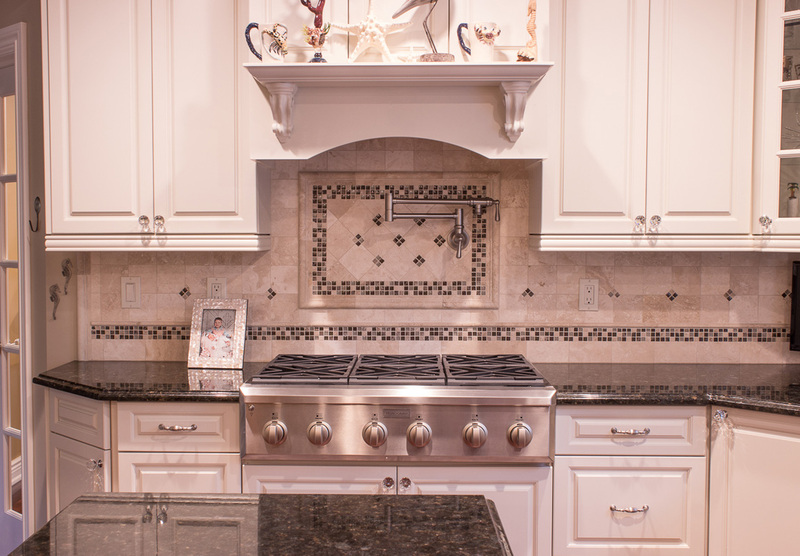 You can see how we incorporated a pot filler faucet into the stove backsplash of this Laurel Hollow home. Notice how the finish of the faucet perfectly complements the finish of the stove. Both stoves and sinks can benefit from backsplashes that are made of materials that resist moisture and are easy to wipe down. If your stove and your sink share a wall, it makes good sense to extend the backsplash so that it reaches behind both of these kitchen fixtures. Instead of having two separate backsplashes, you'll have a full backsplash wall. You can get a sense for this approach in this Saint James kitchen that we designed. The dark line of narrow tiles that runs along the length of the backsplash adds an element of interest to what might otherwise be considered a dull expanse of basic neutral tiles. You want your room to have a sense of rhythm to it; in fact, that's one of the basic principles of interior design. When a room has a strong sense of rhythm, your eyes move naturally through the space. One way to achieve rhythm is through repetition. A repeated design lends balance and stability to a view. Contrast is another way to infuse a room with rhythm. With this element, two different or opposing elements call for your attention, so your eyes move from one to the other and back again. 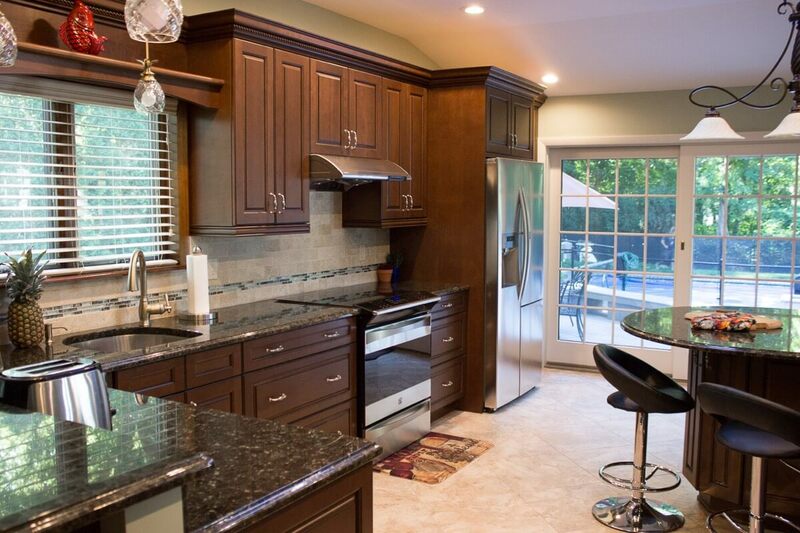 Notice how we incorporated both elements into this contemporary Baiting Hollow kitchen and eating area. The design of the mosaic backsplash behind the stove is repeated above the counter in the adjoining room. Coupled with the strong contrast between the light cabinets in the kitchen and the dark ones in the breakfast nook, this design evokes a strong sense of rhythm. Another basic element of design is texture, which refers to how a surface feels or appears to feel. Smooth tiles, soft towels, and wood-grain cabinets are some of the ways that kitchens can incorporate tactile textures. Contemporary kitchens often focus on smooth, flat or sleek textures. More dimensional textures can invoke a sense of traditional design, particularly if the elements rely on classic motifs, such as geometric, floral or scroll patterns. You can create a three-dimensional design for your backsplash by using tile pieces that jut out from the wall or ones that sit on top of a lower layer of tile. As an example, take a look at the texture of the stove backsplash in this Port Washington home. A line of trim in a twisted-cord design delineates the division between two different tile patterns, and a dimensional border adds definition to the backsplash. Three geometric tiles draw attention to the center of the backsplash. 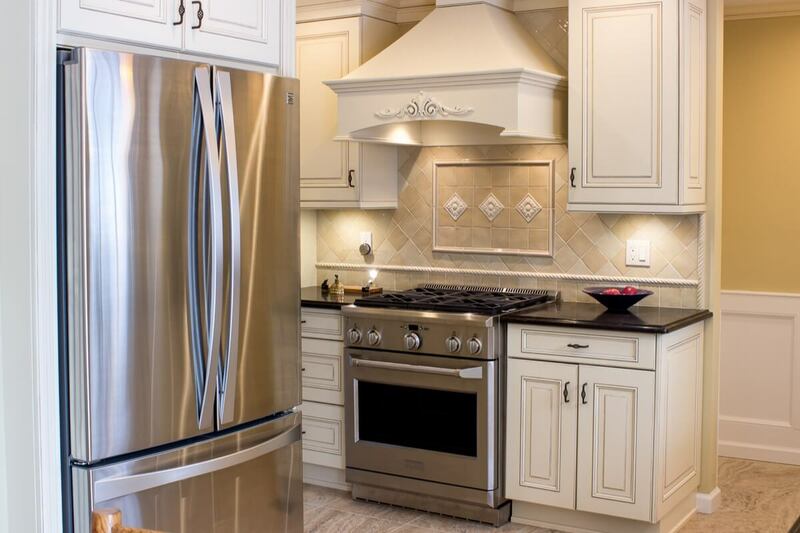 Their classic design ties in well with the filigree applique on the vent hood above. There may not a more familiar tile look than classic subway tiles. First used in New York City subway stations, this staggered arrangement of ceramic tiles is now used in kitchens and bathrooms throughout America. Typically, subway tiles have a height that measures half of their width. Subway tiles are durable, so they make a great backsplash material. In fact, you can even use this design all the way around your room. That's a particularly popular look in transitional kitchens, which incorporate elements of both contemporary and traditional designs. 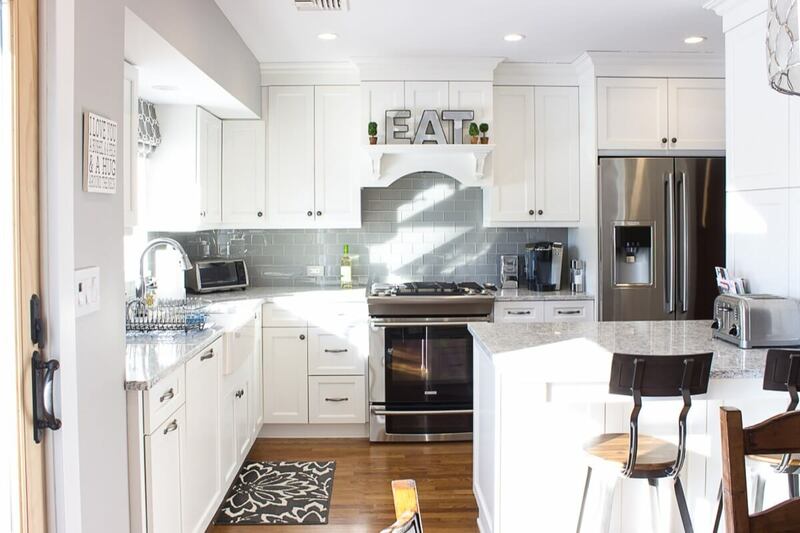 Check out this Commack home, where gray subway tiles provide a clean and simple backdrop for the stove, the counter and the sink. Every time you cook at the stove, you stand facing the wall. Why not beautify this space with an attractive piece of art? You could stick just any appropriately sized painting or wall hanging in this spot, but your artwork could easily become damaged by cooking splatters. Instead, consider filling this space with a painting that is applied directly to sturdy tiles. The design could be painted on one large tile, or it could be made up of several smaller tiles. The pastoral scene on the backsplash mural in this Smithtown home complements the Tuscan feel of this traditional kitchen. 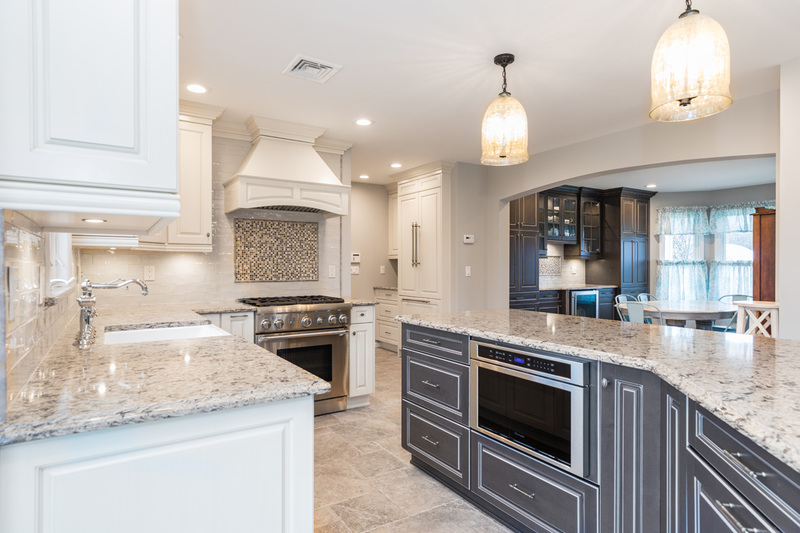 Whether you want a kitchen that's contemporary, traditional or somewhere in between, your kitchen backsplash design can contribute to your desired look. The best backsplashes both protect your walls and seamlessly enhance your kitchen's design scheme. To learn more about incorporating one of these kitchen backsplash ideas into your home, contact us for a design consultation.